You can almost hear them hooting. 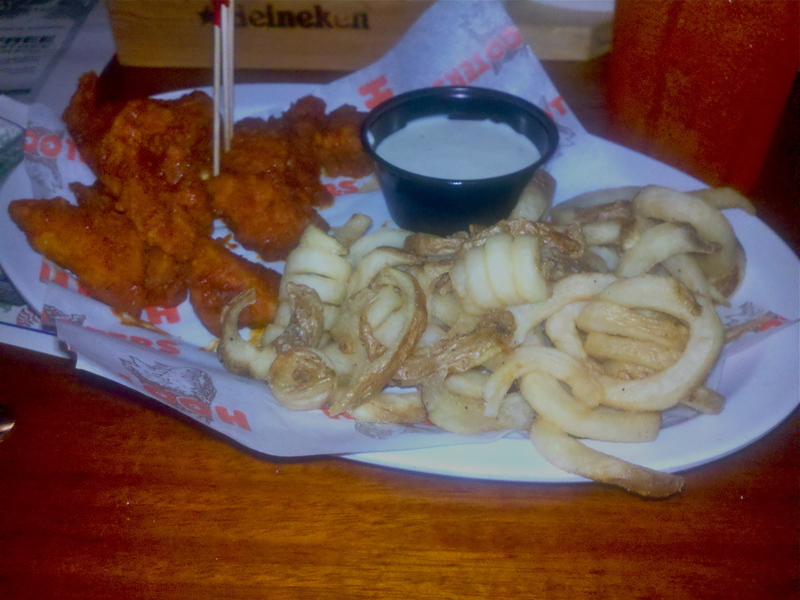 It’s hard to believe that in the year-plus of writing for my meat blog, I have managed to not step foot in Hooters. Yet, somehow, I have avoided that magical land of orange booty shorts and ummm owls. But fear not, because after a little birthday reminder attached to a free entree coupon, I went back to visit my old friend. I took with me one of my only friends who actually appreciates Hooters for what it has to offer. When we walked into the Santa Monica location, we were greeted by friendly faces. Now to be honest, I didn’t actually find the women working there that impressive. They were definitely friendly and cute, but there are just so many beautiful women in LA that these just didn’t impress too much. This only helped me concentrate on the food to make sure my review was unbiased. Can I get some extra strength fries next time? Apparently on Wednesdays, Hooters has a pretty amazing deal that includes 10 boneless wings and curly fries for only five bucks. Although I prefer my wings fully boned, this was pretty hard to pass up, but I knew it wouldn’t be enough to satisfy me. So in addition to that, my buddy and I split an additional 10 wings for $9.49. For the boneless wings, I chose their second spiciest sauce, called 3 mile Island. For my additional five wings I decided to try out their spiciest sauce, called 911. One would think the location of the nuclear meltdown would merit the spiciest sauce at Hooters, but one would be wrong. On top of all that, I figured I could use some cheese with my fries so I ordered a side of that. After about 15 minutes, our meal arrived. The boneless wings looked pretty tiny, but there were still enough to make the deal work. The 3 Mile Island sauce tasted great and reminded me of what I had missed about Hooters. It would have tasted better on real wings, but again it was too hard to pass up the deal. As for the fries, unfortunately, the cheese that I had ordered for them had a arrived in a sad, congealed state. I alerted the waitress and she brought me a new cup of cheese in exactly the same state, so I am led to believe this was not a simple mistake and this was actually how the cheese was meant to be served. This would have been okay if the fries had been hard and crispy, but sadly they were a little wimpy and hardly able to penetrate the thick top layer of the cheese. I lost a lot of good fries that night and would have lost more if it wasn’t for the courage of a few good (heavily coiled) fries. Finally, there were the real wings with the 911 sauce. They sat on one of Hooters’ signature brown plates with a pool of oil already forming around them. After a quick dip in blue cheese, they were ready for eating. Now these were some wings. The sauce wasn’t painfully spicy and actually didn’t send me running for water or beer. Instead, the spice gave me a kick and a smile. This was the real reason to come to Hooters. Sure, the girls are nice and the atmosphere is enjoyable, but it’s really all about the wings. In addition to my own wings, I tried a couple of my buddy’s Spicy Garlic and Hot flavors. Although the chicken part was good, I would definitely advise against these. 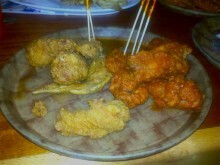 The Spicy Garlic really just taste kind of oily with a hint of garlic and the Hot wings aren’t very spicy at all. No need to waste stomach space on these guys. So in the end, Hooters is still a good place for wings if that’s what you’re looking for. If you’re looking for some of the other things that Hooters offers (wink wink), make sure to head to the Hollywood location, because Santa Monica probably won’t impress you.